The popular restaurant chain Timebre, in Singapore, has employed a number of flying drones to deliver food and drinks to its customers. A drone is a small flying robot, which hovers in the air using lightweight propellers known as a micro-copter. These futuristic objects have been gaining fame recently for their contribution to film and photography, capturing incredible images of cities from above, as well as filming incredible time lapses. Now though, Timebre and electronics company Infinium Robotoics have joined together to put these drones to a more practical use. The drones will be used to hover over the busy dining area, and serves dishes to each customer by a delivery platform. These specifically designed drones do not require to be navigated by a human pilot and can carry up to 2kg. Fortunately, the introduction of these flying trays do not mean that waiters will be out of work. Whilst the drones deliver the food, the waiters will now spend more time interacting with the diners, and taking the food from the drone’s platform to give to each customer, as well as the usual jobs such as taking orders and clearing dishes. If the Timebre restaurant is successful though, dinner-by-drone could become a permanent solution to a huge hiring issue. 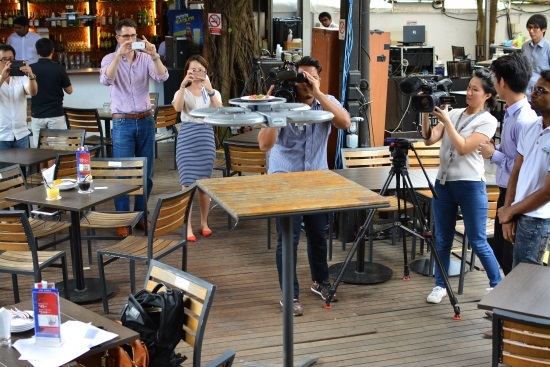 Due to the occupations low value within the Singapore culture, businesses in the restaurant industry often find it difficult to employ and retain waiters and bar staff, thus the drone will help lift - pun intended - the pressure of short staffed eateries. Check out this BBC coverage of the drones at work. See here for more information on visiting Singapore.